This beautiful preserve tastes as lovely as it looks. 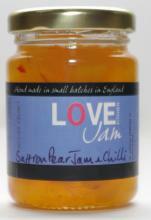 Sweet and spicy with a hint of saffron hue, it is delicious with both sweet and savoury pairings. Try it with a cold game pie or a meaty terrine, or as a topping for soft puddings.